A Creamy Tomato and Pesto sauce combining tomatoes, cream, Imokilly Regato cheese, basil and pine nuts. 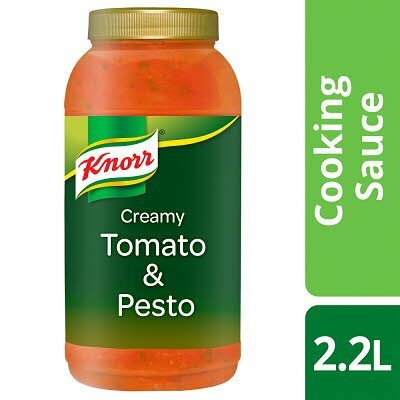 Water, tomatoes* (36%), tomato paste* (7.0%), onions, CREAM (2.7%), sugar, glucose-fructose syrup, modified maize starch, imokilly regato CHEESE PDO (1.8%), CREAM Powder (1.5%), basil, dehydrated onion, garlic, pine nuts (0.4%) (contain SOYBEAN extract), salt, acid (lactic acid), oregano, rapeseed oil, black pepper, natural flavouring. *made from sustainably grown tomatoes.